The North shore of Kaua’i is spectacular! You will find the most amazing scenery on the planet, including the Na Pali Coast’s soaring cliffs that rise 4,000 feet above the ocean and our many wonderful, award-winning beaches. Kauai’s white sands meet crystal clear water with inlets, private coves and more outcrops than other islands. The beaches on the north shore offer beauty and recreation that many others cannot match. ~ Facilities include restrooms, showers, a large pavilion and BBQ areas. Great spot for the whole family to enjoy a day at the beach. The center of the bay is Pavilions, a popular beach for surfing, bodyboarding, boogie boarding, kayaking, stand up paddle boarding, windsurfing, sunbathing, walking and running. Lifeguards man this section of the beach. ~ Facilities include restrooms and showers. There is no cell reception, but there is a payphone. Parking is limited. There is a dirt parking lot about a quarter mile from the end of the road for overflow parking. Located at the end of the road. It is the beginning of the Napali Coast and the Kalalau trail that leads to Hanakapiai and Kalalau Beaches. Ke’e is protected by a reef that make it a great place for snorkeling and swimming. During the summer months the water can be as calm and clear as a swimming pool. During winter months dangerous conditions may include high surf and strong currents. It is known for its beautiful sunsets. ~ Facilities include showers and restrooms. One of the most beautiful beaches in the world. It is located at the 8-mile marker in Haena. Tunnels is famous for its wonderful snorkeling and diving during summer months. There is plenty of shade. ~ Facilities include lifeguard station, restrooms and showers. Lush and tropical. Mount Makana (Bali Hai) looms mysteriously above Haena Beach, offering a spectacular backdrop for sunsets and photo opportunities. Great swimming and snorkeling. Explore and collect shells. During the winter months the surf can be extremely large causing dangerous shore-break and strong currents. Check out the Maniniholo dry cave across the street from Haena Beach Park. ~ Facilities include picnic tables, showers and restrooms. Anini Beach is protected by Hawaii’s largest reef. Wonderful snorkeling! Great place to bring the keiki (children). You’ll find lots of shade and grassy areas. 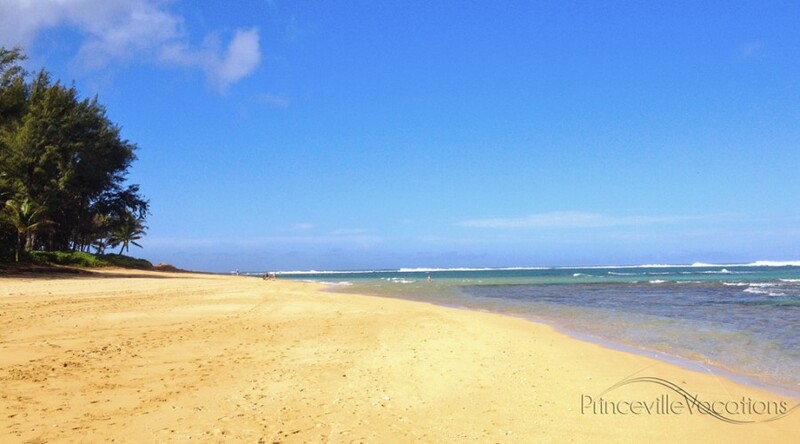 The beaches of Kauai’s North are the most beautiful on the island. North shore beaches boast miles of white sand, lush green foliage and many have views of the rugged NaPali coast and famous Bali Hai. Kauai’s East shore is known as the Coconut Coast. It has golden beaches with easy access and a popular bike path. The South shore is typically drier than the North shore and therefore less green. There are some decent South shore beaches and some great historical spots to visit. Aloha! Come visit Kauai with Princeville Vacations. We are your Kauai vacation and real estate connection. Let us welcome you to the beautiful Garden Isle where you may enjoy all that we have to offer from Mountain to makai (ocean.) Come walk our miles of white sand beaches, go horseback riding, swim, snorkel, surf, fish, sightsee, hike, golf and so much more! The Garden Island of Kauai is paradise and we look forward to sharing it with you. Search here by date, browse by Vacation Homes or Vacation Condos or give us a call. 800-800-3637 Aloha!